Foggers are an essential element for climate control through cooling and humidification. 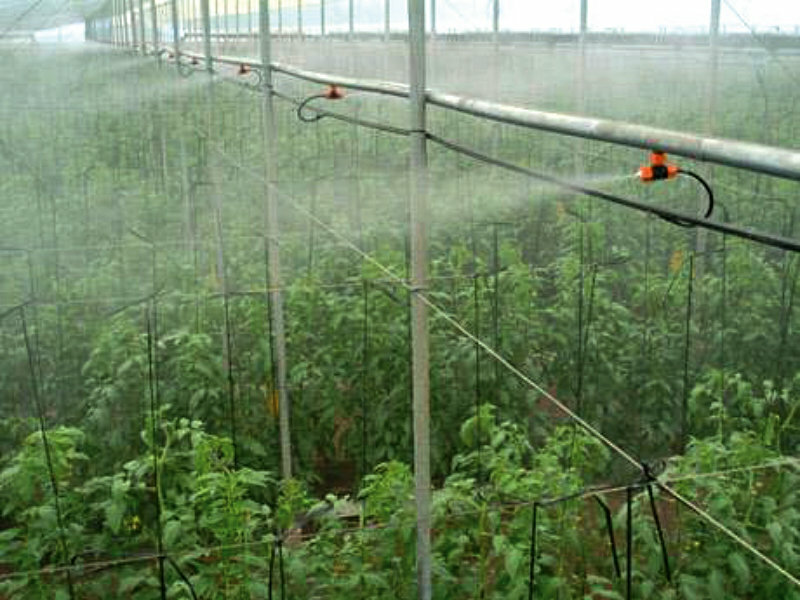 The success of a fogging system depends on how precisely it can maintain the required droplet size. With convential foggers, the average droplet size is usually 80 to 100 micron at about 4kg/cm² pressure. NaanDanJain's patented TurboFog technology delivers an adjustable droplet, which starts at 3 micron, that can be dispersed uniformly at much lower pressures. Turbo Fog is a patented hydro-pneumatic fogger, which provides a unique compressed air-water fogging system and operates at low air pressure (2kg/cm²- 2.5 kg/cm²) and low water pressure (2.5 kg/cm² – 6 kg/cm²). Droplet size (micronisation), fog distance (cloud) and flow rate per nozzle can be varied & adjusted based on application requirements, by simple regulating air and/or water pressures. The compressed air forces the fog atomisation to exit the Turbo Fog nozzle at high speed (4m/s measured at 4 meters distance from the nozzle) and creates a micro-ventilation effect. Turbo Fog’s state-of-the-art atomising nozzle achieves maximum application homogeneity, longest atomised spray distance and fully variable flow rate and droplet size per nozzle compared to its competitors. The smaller the Turbo Fog nozzle diameter is, the lower the compressed air consumption will be, and the shorter the atomising spray distance will be. Larger the Turbo Fog nozzle diameter is, the higher the compressed air consumption will be, the finer the droplet size will be (down to 5microns average droplet size) and the longer the atomising spray distance will be. Due to the significantly low running costs, easy installation, low maintenance and long service life, the Turbo Fog system will increase your business productivity and achieve high application performance and efficiency.